EAL – Year 8 EAL pupils show Year 3 how to make stained-glass window Christmas decorations, using ‘bossy’ imperative verbs. RS – Year 3 have been revisiting the story of advent and the nativity; they have enjoyed using their creativity this week to produce some imaginative and original artwork. Geography – Year 8 pupils are doing the groundwork about cities in preparation for their visit to the Greenwich Peninsula next term. Year 7 have studied the floods at Boscastle and Robertsbridge examining the cause, effect and response to these events. Year 6 have looked at the cost and effectiveness of coastal protection schemes along the Holderness coastline. Year 5 have been summarising their work on denudation and consolidating their knowledge ready for a test! 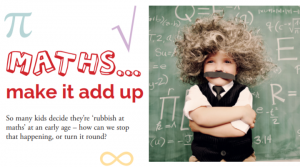 Maths – Year 3 investigated multiplication and division in maths and some were starting to see the connection between these inverse operations. Learning Journey – In preparation for Christmas and linking with the theme of the week, Year 3 learned about the history of the advent wreath before creating their own designs. 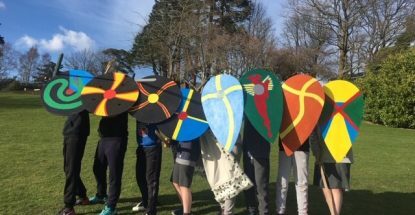 Year 4 enjoyed learning about Celtic warriors in their Learning Journey. They had their faces painted with blue ‘woad’ and insisted on keeping this war paint on for their hockey and rugby sessions straight afterwards! Science – 5G dissected lambs’ hearts! They thoroughly enjoyed the experience and really explored the inside of the heart. Debating in Year 3 – George Stephenson (aka Mrs Alderson!) 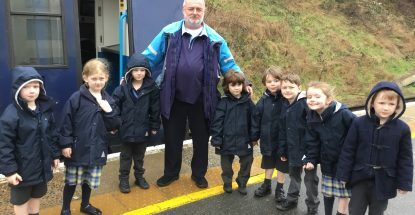 visited Year 3 to listen to their views on the invention of the railway as they debated the pros and cons in role as inventors, farmers, politicians, the upper class, factory owners, canal workers, railway workers and campaigners. 4P and 4B have been acting out the story of Zacchaeus, the tax collector, in RS. The most exciting part was when they performed the story as a play outside, acting as peasants who had to pay tax to Zacchaeus (Albie and Charlie P). Zacchaeus had to climb a tree! Jesus (Sebastian and Elizabeth H) was greeted like a celebrity as he came into ‘Jericho’ and managed to persuade Zacchaeus to change his ways. English – Year 4 were stretching their imaginations today as they imagined themselves soaring through the air like an eagle over the Scottish highlands. 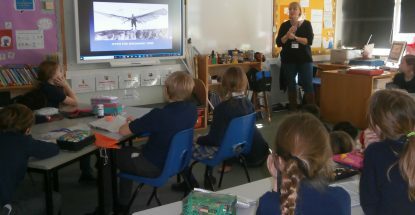 We watched an amazing two-minute clip of a golden eagle with a camera attached to its neck swooping and soaring over a snowy landscape as part of a lesson on “How to train your dragon”. Year 3 have been stepping back in time and discussing the invention of the railway. They have been taking on the roles of all parties; campaigners, workers, politicians, inventors and factory owners to debate the pros and cons. Science – Years 6 have been investigating balanced and unbalanced forces. Years 7 and 8 have been looking at respiration and lung function, in particular, the effect of smoking on a healthy lung. 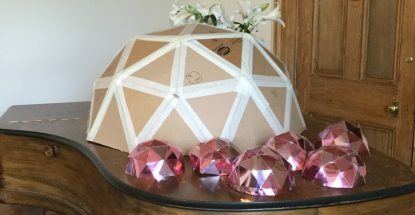 STEM – Children have been looking at building emergency relief shelters out of limited resources as well as the need for water filtration systems in disaster zones. EAL – Year 8 have been preparing for their Cambridge PET exams. Children are also looking at Sherlock Holmes and The Three Musketeers in guided learning. RS – Year 5 have been learning about Judaism in RS. This week they tasted some of the food that is eaten at the festival of Passover – a special Seder meal. The children were interested in why certain foods are chosen (for example, horseradish is eaten to remind Jews of the bitterness of slavery that the Israelites had to bear in Egypt). French – The children were learning using the interactive white board. Click here to view the short video of their lesson. Latin – Taking PJ day to the maximum, our seniors enjoyed some Friday afternoon classics time watching “The Odyssey” movie. 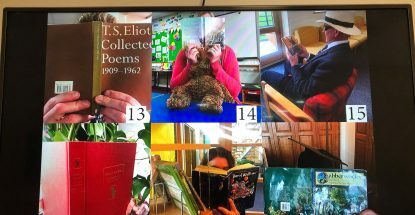 English – Metaphorical Magic – The Year 7s had an inclusive, lively and challenging lesson taught by Francis C.
History – Year 6 have been learning about Bloody Mary and spent time this week looking at how childhood nursery rhymes can sometimes have a historical basis. Did you know that Mary Mary Quite Contrary was in fact based on Bloody Mary and referenced her inability to have children? Technology – At the lower end of the Prep School the children have been set a mission to complete the coding for their game. they are making it from scratch bu memorising code and learning “if” statements. In juxtaposition our Year 8 students are continuing with their project to achieve their own fully interactive website using html code. Geography – After the academic rigour of exams last week Year 8 pupils enjoyed a craft lesson this week making volcanoes. Our Year 5 geographers enjoyed using ice lollies as a way of exploring glacial erosion. French – Year 7 have been translating “Ma Routine Quotidienne” – how well can you do with this short extract? D’habitude, tous les matins, je me réveille à six heures et demie du matin et je me léve vers sept heures. Ensuite, je me douche, je m’habille et je prends le petit déjeuner. Je n’oublie pas de me brosser les dents! Je vais à l’école à huit heures et demie. Parfois je vais à l’école à pied, mais, si je suis en retard je prends le bus. Latin – Our year 4 Latin students have been completing their Minimus workbooks looking at colours, animals, adjectives, verbs and nouns. History – Year 3 visited Mountfield Church as part of their learning journey into local history. Jackie Spriggs kindly showed us around and the children were great at listening and asking thoughtful questions. The pianists amongst us went into the organ loft to see how the organ is played! Maths – National Young Mathematicians’ Awards On Tuesday 6th November four of our Year 6 students entered the first round of the National Young Mathematicians’ Awards. This is a new competition for Vinehall students so we talked about what will be expected, the format the competition would take and did a practice problem. This meant we were now ready to leave after break and travel to Ashford. The national competition is focused around problem-solving and gave the pupils opportunities to display their collaborative skills and their fearless approach and resilience to problem-solving; trying a solution, improving on it and seeing whether there are other solutions. The problem itself in this first round was a never seen before challenge using dice. 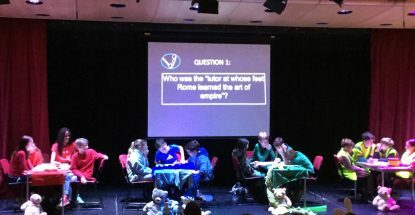 Francesca, Matilda, Henry and Bertie were praised for their teamwork skills and we eagerly await the results to hear whether Vinehall School are through to the second round in December. 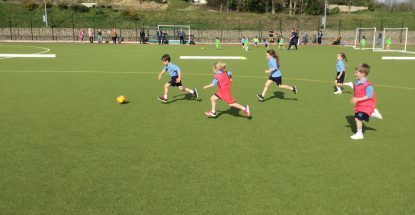 Science – Year 3 investigated whether those who did a lot of sport might have a bigger lung capacity than those who did less. This triggered a lot of discussion and, when they looked at the data they had collected, the children found that one of the smallest in the year group had the biggest lung capacity of all, and she did in fact do an awful lot of gym and swimming each week! Fractions (are fun!) – In maths this week Year 3 have investigated which numbers can be split into thirds and quarters, hopefully seeing the link with times tables. One group had a challenge to see which numbers over 60 could divide equally into thirds, quarters and sixths. Brains were buzzing! Literacy – Year 3 visited the Pre-Prep this week to read their own ‘Just So’ stories to the Year 2 children. Miss Bidwell was delighted to read these super compositions that her previous class had written after visiting Bateman’s in October. Mrs Everist and Mrs Hawtin were impressed with how well the Year 2s listened – thank you for letting us visit, Miss Bidwell! Year 8 have been studying photosynthesis and learning how to test a leaf for starch, usually a GCSE assessed practical. Our children enjoyed the experience and were all successful in their experiments. Year 7 have been studying cells and cell structure and the differences between plant and animal cells. Year 6 have been looking at combustion reactions and how to present data derived from experiments in a graphical form. Latin – Year 8 have been preparing for their exams by looking at the imperfect tense and the subjunctive. Year 6 and 7 have been looking into myths and legends with Odysseus, Cyclops cave and Circe’s palace. Science – Year 6 have been taking their test in order to obtain their Bunsen burner licences. We are pleased to say that they have all passed and now can progress onto more advanced practical work in science. Geography – The Year 8 Geographers are writing up their fieldwork reports following their visit to the Bexhill Beach last week. Year 7 are carrying on with their topic on rivers, Year 6 theirs on coastlines and Year 5 their topic work on denudation. 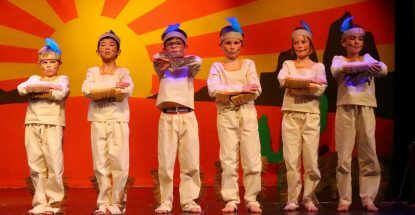 RS – Last week in RS Year 3 were finding out how the harvest would have been at the time of Jesus. One of the things they did was taste figs, grapes and olives – foods that were grown two thousand years ago and still are today! Thank you, Chef Ian! STEM – We have got off to an exciting and very relevant start this term. We have been looking at different types of natural disaster and their effects and are starting to think about the recovery from such an event. Looking at Hurricane Florence and the recent Earthquake and Tsunami in Indonesia, the high profile recent natural disasters, has been very helpful to forge a greater understanding. We have used current news reports and video clips from different sources,including some elements of social media. In our discussions about the aftermath and recovery, we have looked back at Hurricane Katrina and in particular how we could use our Sports Hall as a recovery centre. We have been to the Sports Hall to measure its total area and calculated the surface area required by one person with a sleeping bag, pillow and holdall, so we can see how many people we could accommodate in the event of a natural disaster. I have been so impressed with the pupils’ knowledge, open-mindedness and desire to question and understand this new subject. Poetry Day, Year 3 had a treat when Mrs Alderson came to read Roald Dahl’s Goldilocks and the Three Bears as part of World Poetry Day. The children warmed up this drama session with some fantastic games, using their bodies to make pictures of a magical forest, the big and little bears and the naughty Goldilocks, as well as group shapes to represent a bowl, a chair and a bed! They listened very well, were very creative and enjoyed themselves enormously. 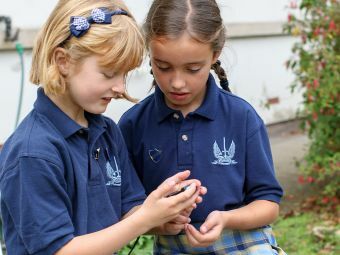 Science – Year 3 learned about invertebrates and vertebrates in science, before creating their own human skeleton. The results can be seen in the De Beer corridor. 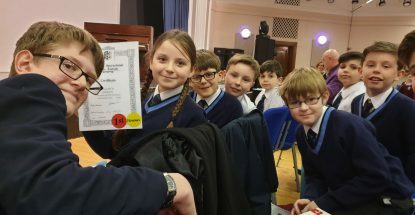 Maths – Last Thursday, four Year 5 pupils – Faris A, Lorcan G, Clara F and Elizabeth G – travelled to Christ’s Hospital School for a maths challenge. Just as we arrived, the CH children were marching into lunch to the music of the school’s marching brass band, which is daily tradition of long-standing; it was very impressive. We then went into a magnificent hall where lots of challenges had been prepared. The children worked in pairs solving puzzles and completing other mathematical problems. 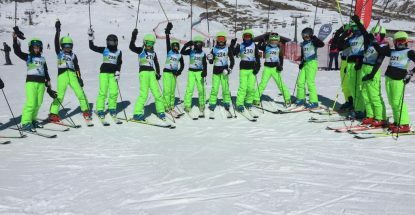 They appeared to enjoy the event and came 14th out of 46 teams. Well done, Vinehall! French – This week the European Day of Languages was celebrated on Wednesday 26th September. Amongst various linguistic experiences and songs, Year 4 learned a little Spanish and were intrigued to notice the similarities between the contents of their pencil cases in both languages. Year 6 learned how to greet, say their names, thank and bid goodbye in German and some pupils shared their knowledge of Danish (thanks to Daisy F) Russian (Eric R) and Greek and Gaelic (Delilah G). We are fortunate to have in our community several speakers of languages further afield than Europe and in due course we hope to celebrate our global linguistic diversity. Geography – Our geographers have certainly been fulfilling two of the five dispositions this week, with ‘Collaboration’ and ‘Inquisitive’ coming to the fore with the Year 8 trips to Bexhill Beach and the Year 7 trips to the River Line in our school grounds. The Year 8 fieldwork is part of their Common Entrance coursework examining the relationship between stone size and proximity to the sea. Year 7 pupils were seeing if our local river met the criteria for a model river in its upper stage. All great learning and fun. EAL – It was such a beautiful day that I decided that it would be a great idea to have our prepositions of movement lesson in our stunning grounds. We were delighted to see so many parents at Mr Borrows’ talk on our core values and changes to Common Entrance. For those of you that missed it, you can find the accompanying handouts here in the parents section. 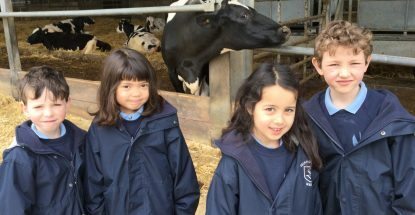 In French, our younger linguists in the Pre-Prep have been learning about colours, numbers, pets and ages using songs to help embed their language knowledge. Bravo! We hope they are entertaining their parents on the journey home. Our senior scientists have been looking at plant cells and were tasked with creating a 3D model as prep. The photos below show how successful this was with models being made in many mediums, including cake! 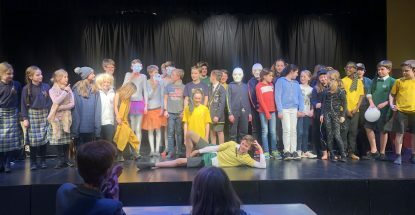 Well done Year 7. Year 5 have completed some amazing science prep on their topic of Space. These are displayed in the De Beer corridor and outside Mrs Gearey’s room. Please come and see it if you have a moment to spare as they have put a lot of effort into it. Mr Powis thinks it’s amazing and a big thank you to Mrs Walker who displayed it so cleverly. Our EAL students are enjoying our new language lab facilities. These are in use by all students and we are extremely grateful for the donation of the computers. In Science, Year 5 are learning to use compasses to draw the planets. Year 3 investigated diet and grouped food according to type. 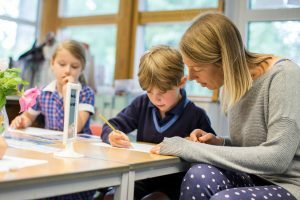 See our Assistant Head, Academic’s article in the latest Wealden Times below.